The Longhorns nickname traces back to 1903, when journalist D.A. Frank added the moniker to a laundry list of words-Steers, Varsity, etc.-used to describe the University of Texas football team. 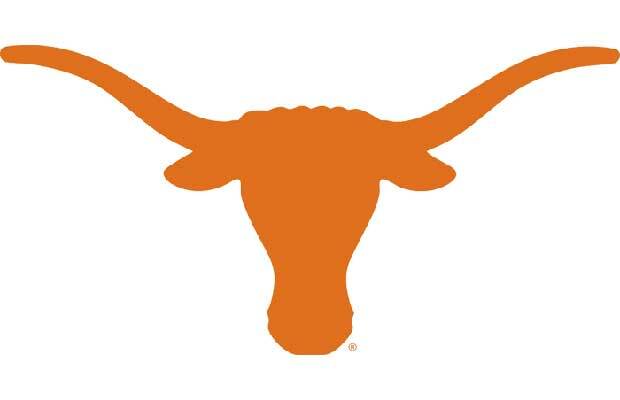 A Longhorn logo was first employed on a blanket gifted the squad in 1913. After that, history finds Longhorn images all over Memorial Stadium and closely associated with the orange-wearing school from Austin. It was not, however, until 1961 that the Longhorn we now know and love appeared. In the grand tradition of sporting logos designed by amateurs, this one was created in crayon by sporting-goods merchant William "Rooster" Andrews. His longhorn head silhouette first adorned helmets when the Longhorns hit the field on September 23, 1961 in Berkley, California. The image hasn't faded from memory since.